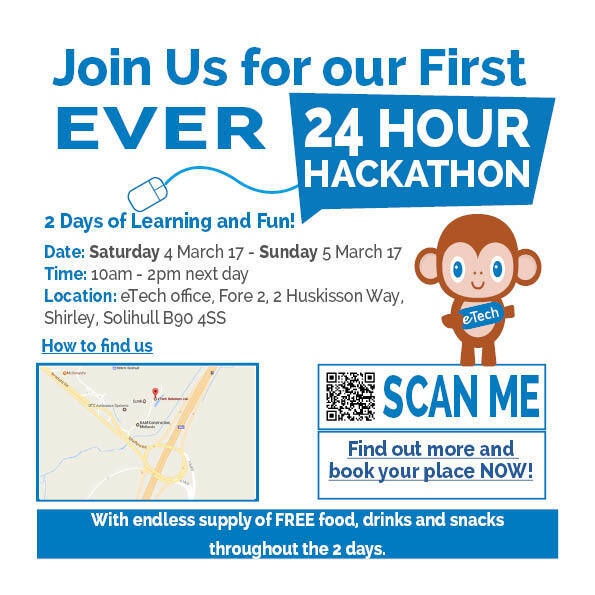 eTech will be running their first ever Hackathon “eTech Code Monkey Hackathon” on Saturday 4 and Sunday 5 March 2017 at their offices in Solihull. The Code Monkey Hackathon is a free, fun filled 24-hour event designed to bring like-minded developers together to collaborate on problem solving projects and skills acquisition. This is an ideal event for budding developers looking pursue a career in programming. The two days will consist of workshops, presentations and knowledge sharing by eTech’s experienced development team with the opportunity to learn what eTech are about. The fun doesn’t stop there; there will be gaming, competitions and entertainment with plenty of food, snacks and drinks available, with eTech’s friendly helpers on-hand to organise things.